Thyroid disease is a condition where it becomes difficult for the body to regulate and produce important hormones. Unfortunately, the problem can be difficult to diagnose despite that fact that over 30 million people in the U.S. are living with the disease. 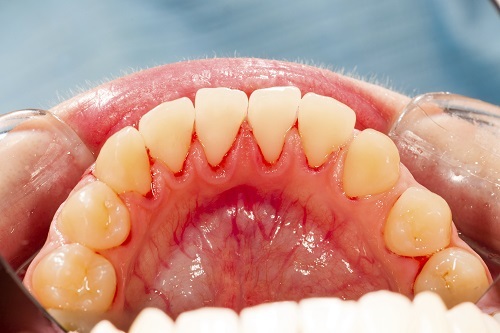 This condition can affect the body in a variety of ways, including your oral health. • Enlarged tongue. Known as macroglossia, this condition is a common symptom for people who are suffering from thyroid disease. When the tongue is enlarged or swollen, even the easiest activities can become difficult, including swallowing and talking. Your ability to sleep through the night could also be affected. • Dry mouth. Thyroid disease can cause dry mouth, which can increase your risk for cavities and gum disease. The saliva is needed to keep the teeth and gums free of plaque, bacteria, and food debris, and if flow is disrupted, decay could result. • Gum disease. Thyroid conditions could inhibit wound healing in the body, which is especially problematic in the mouth. If the gums are weakened, they will be more prone to developing infection. • Accelerated eruption. A problem that affects children, if thyroid disease is present during the younger years, it is possible that the teeth could erupt faster and earlier than normal. This could result in a problem with proper oral development in those kids, and it is possible that they might need orthodontic correction in order to treat the issue in the future. Are you concerned that your diagnosis of thyroid disease might be negatively affecting your mouth? Contact our office today. Likewise, regular dental evaluations can also detect problems like thyroid disease and other issues that could impact your health.